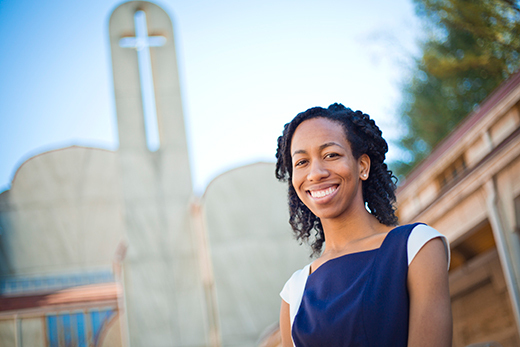 When Jeania Ree Moore decided to attend Emory's Candler School of Theology, she wasn't sure exactly where the experience would lead. Yet a campus visit nearly three years ago left her feeling both a sharp connection and a deep calling. "I didn't quite know what I was looking for, but it became clear to me that Candler had a lot to offer — I made the leap of faith to come to the South," recalls Moore. "I didn't know what it would yield, but it's been more than I ever expected." This semester, her experience at Candler indeed brought unexpected opportunities — in February, Moore was awarded the Gates Cambridge Scholarship, a prestigious fully funded scholarship given to students outside the United Kingdom to pursue a postgraduate degree on any subject available at the University of Cambridge in England. "I've only been studying theology for a few years, so I really hope to use this opportunity to refine my skills as a scholar and gain some real sense of grounding in a huge, huge field, which is part of the reason why I love it," says Moore, who reports she is "thrilled and excited" to receive the award. Gates Cambridge applicants are selected for outstanding intellectual ability, leadership potential, and a commitment to improving the lives of others with a goal of building future leaders and change agents. The program was established in 2000 with a donation from the Bill and Melinda Gates Foundation, according to the University of Cambridge. Since the scholarship's inception, Moore is the fourth Emory student to be named a Gates Cambridge scholar — and the first from Candler. She is currently completing a master's of divinity degree at Candler, with a focus on the field of theological aesthetics — the interdisciplinary study of theology and aesthetics, including the arts — and is a candidate for ordination as deacon in The United Methodist Church. Out of an alumni pool of more than 1,300 Gates Cambridge scholars, Moore is only the fourth student selected to study theology and religious studies within a program that has traditionally chosen more students from the physical, natural and social sciences than the humanities. While at the University of Cambridge, Moore will pursue a one-year master's degree of philosophy in theology and religious studies. Out of more than 750 U.S. applicants, Moore was among 40 students selected to receive the scholarship and will be joined by 55 scholars from other parts of the world. "We are absolutely delighted to announce our new U.S. Scholars," says Professor Barry Everitt, provost of the Gates Cambridge Trust. "They are an extremely diverse group of outstanding individuals who are both intellectually exceptional and show a dedication to improving the lives of others. We look to them as future leaders who will change the world for the better." Born and raised in Pasadena, California, Moore arrived at Emory by way of Yale University, where she received a B.A. in humanities and developed her interests in religion, culture and the arts. With a personal background in the arts — including years of participation in choirs and the visual arts, along with classical piano studies — Moore found that Candler would allow her to meld her interests in religion, culture and the arts with Christian theology, "where I use the discourse of theological aesthetics to reconceptualize the doctrine of personhood in African American experience and theology," she explains. While at Emory, Moore's experiences have continued to open unexpected doorways. But few would be as impactful as an opportunity to perform field education in ministry during her first year at Candler, an experience that would put her in the role of prison chaplain at Lee Arrendale State Prison, a Georgia state women's prison located in Habersham County. It was there that she would "preach my first sermon," Moore recalls. It was also where she would meet Kelly Renee Gissendaner. Convicted for her role in the 1997 murder-for-hire of her husband, Gissendaner had enrolled — and graduated — in the Certificate for Theological Studies program offered through the prison. Her face-to-face interaction two years ago with Gissendaner, who was awaiting execution, was brief. "I served Kelly communion," Moore says. "I offered her the words of grace that, for a Christian, speak to the fundamental situation of humanity: redemption." But the experience would inspire engagement. Earlier this year, Moore became one of several student leaders who began mobilizing support for Gissendaner. "Our efforts grew out of a prayer vigil I organized — we were just trying to process and respond as people of faith," says Moore, whose experience at the prison and opposition to the death penalty drew her to join others in prayer the day of Gissendaner's February clemency hearing. When clemency was denied and the execution was scheduled to occur within a week, Moore was "surprised and devastated." Mobilizing a small group of students, clergy and theologians, she quickly helped craft an online petition through Groundswell.com. The petition protested the planned execution and asked that Gissendaner's sentence be commuted to life imprisonment; it drew more than 80,000 signatures in 48 hours. The morning of Gissendaner's scheduled execution, Moore joined other students in delivering boxes of 40,000 petitions to Georgia Gov. Nathan Deal's office, and later drove to a location outside the execution facility to join more than 100 protesters for a five-hour prayer vigil. That night, the execution was postponed after officials cited concerns about the lone drug that would have been used for lethal injection. Gissendaner would have been the first woman executed on Georgia's death row in 70 years. While the experience may seem outside her immediate academic focus, Moore says that it was actually "very helpful and clarifying" about her desire to "do work outside the four walls of the church. "A big part of my focus on theological aesthetics in the lives of African American women and the African American experience is the significance of ugliness, lynching, violence, and oppression of various kinds — that is the ugliness in life," she says. "I've been researching theological accounts of evil and ugliness, and that theology that has powerfully met what I've seen and experienced over the last few weeks." It was during her studies at Candler, where Moore also holds a Robert W. Woodruff Fellowship, that she says she "felt and accepted my call to be a deacon." She is halfway through the ordination process and looks forward to the ability to "do ministry throughout my career with focus on a ministry of justice and compassion." While at Cambridge this fall, Moore will continue her exploration into theological aesthetics by turning to music to examine how the phenomenon of beauty sheds light on justice in the doctrine of Creation. "My faith identity is fundamentally not about books alone, it's about the impact it has in people's lives, the reality of Christ being lived out in the world," Moore says. "I do plan to focus intently on my studies at Cambridge, but I hope not to lose sight of the practical application, because ultimately, that's what it's for."